Fantastic tour, we were taken to our guides home and treated like family and also joined the community in a celebration meal. This tour was well organised and led by Chitty. Yes, it rained heavily which gave another dimension to the reality of living in the Sanjay Colony. The sights,sounds,smells are truly the reality for many. This well organised, lively, functioning community in an economically divided society is a lesson in the harsh realities of life. Our questions were answered we looked, walked and listened. An invigorating experience. We are older independent travellers from the UK and visited in late Jan.2018. I was skeptical after reading some of the mixed reviews into various slum tours, but decided i would find out for myself anyway . Off i trotted with my partner and my pre conceptions in tow only to discover that i was so wrong in what i had expected to see . For people who have nothing in absolute terms i was amazed by the friendliness and sheer enthusiasm of the children as adults we met along the way . They all wanted to say hello and hi 5 us and the memory of the smiles they gave freely will stay with me forever . If going on tours like this is supposed to keep them in slums and encourage them to stay where they are then we should all be ashamed at the lack of opportunity that they face in education,housing and work . I saw nothing but a close knit community that despite everything that was stacked up against them in life looked happier and more content than i see in my own nieces and nephews back in london . If enough of the profits from tours like this are ploughed back into helping the community with education,healthcare and work opportunities then for the generations to come the outcomes can be improved . In fact after a 5 star luxury hotel stay then a tour like this should be the norm for us all . Aside from that this was our third tour in Delhi and the least exploitative. As our friendly guide Vijay from the Sanjay colony himself was with us the entire tour and it never once entered my head that I wasnt totally safe in that environment and also nobody tried to sell us anything either unusually . To finish the day we headed home on the metro with two of the other guides Stanley and Chitti who were going our way . They spent the entire journey chatting and being genuinely interested in talking about themselves,their aspirations and our lives back in the UK . Really an amazing experience. I will strongly recommend this. It is so affordable that the organisation should charge a higher fee. I was surprised the condition of slum is very different from what I observed in Mumbai. I had an amazing time! The locals were so friendly and I felt completely safe. My guide Shehinaz was knowledgable and answered all of my questions even sharing her personal experiences! Would definitely recommend! We thoroughly enjoyed the tour of Sanjay Colony. Our guide was very knowledgeable and the people who live and work within were so generous and friendly. We learnt so much and came away with a totally different perspective. Well worth doing this tour. Tour started at the train station with an explanation of the metro and how to navigate Delhi easily, which was nice. Guide, Shehnaz, explained the NGO's mission and purpose. Tour was a good pace. We stopped at different locations and services in the slum. There were all sorts of interesting sights and smells. We stopped at the head office of the NGO and spoke to the CEO and other staff, which was a nice bonus as we got to see and understand more about what the NGO does for the community. 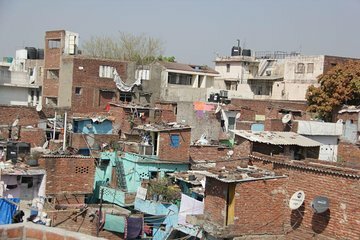 If you do not know much about Indian slum life, this tour gives you a good appreciation of how many Indians make the transition from village to city life. The tour allays misconceptions about slums being just poor people. The ticket price goes towards the education of 13 year old in the slum, which is great this includes life skills. Something to bear in mind, you're out in the heat of the day and it gets hot!! This was a very interesting tour. Wish photography was allowed during this. Learned a lot about the community-school although you are not allowed to go inside one, doctors office, the work of men and women, shops. My favorite part was trying my hand at sorting recycled fabric with the women. This is one of the tours you'll remember for the rest of your life. And also one of the places you really need a professional guide to take you. The organisation providing this tour works to enlighten people about the conditions and day to day life in Dehlis many slums. But foremost they use the profit to educate the children of the slum. Great guide, great tour that grasps your mind and heart. I would highly recommend this!